Coastal landforms are created in two main ways. This is because when waves hit the shoreline their effects can be varied. They can help to create landforms that allow plants and animals to live and thrive, or they can destroy landforms, killing plants and animals or driving them away. The types of waves that erode and destroy sections of coast are known as destructive waves. Destructive waves are tall and frequent, which means they crash intothe shoreline, digging out large chunks of land and eroding the beach. Their swash is weaker than their backwash, causing soil and nutrients to be drawn back into the sea rather than deposited on land. Destructive waves begin in a large, stormy ocean. The waves travel thousands of kilometres, building up energy that is unleashed onto the rocks and sands of the coast. These waves carve the coastline into amazing shapes in much the same way that a sculptor carves shapes from a piece of marble. This process of wearing away is known as erosion, and the landforms created this way are known as erosional landforms. 1 Cliff Cliffs along coasts are formed by the action of waves on rock. The power of the waves erodes softer rock, leaving the more durable rock behind. 2 Cave As waves approach the coast they tend to bend around headlands and islands and attack them from the side in a process known as refraction. When waves encounter a weak spot in the cliff (such as a section of soft limestone) they wear away the rock. They create a small opening, which is soon enlarged into a cave. The waves can now enter the cave and erode the sides and top. 3 Gorge Some caves can be hundreds of metres long. Waves entering long caves can wear away the roof, causing it to collapse and forming a deep gorge. 4 Arch As waves erode the back of a cave they may penetrate right through the headland and produce an arch. Waves may pass through the arch, eroding the sides and top. The arch here (inset) has recently eroded and fallen into the sea creating two stacks (main image). 5 Headland Some sections of the coastline are made up of harder rock than other sections. These can resist the energy of the destructive waves longer than the softer parts and remain as headlands – high, rocky outcrops of land. 6 Bay The softer parts of a coastline wear away more quickly than headlands and become bays. 7 Stack As the soft rock of arches is eroded by the destructive waves, the rock above the arches eventually falls into the sea, leaving behind stacks – vertical columns of rock. 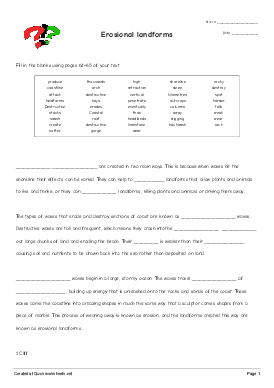 Discussion Be the first to comment about this worksheet. You can download this worksheet by upgrading to a Premium Account.